Dil Dhadakne Do (transl. Let the heart beat) is a 2015 Indian comedy-drama film directed by Zoya Akhtar, and produced by Ritesh Sidhwani and Farhan Akhtar. The film features an ensemble cast of Anil Kapoor, Shefali Shah, Priyanka Chopra, Ranveer Singh, Anushka Sharma and Farhan Akhtar, with a voice-over performance by Aamir Khan as the family dog Pluto, the narrator of the film. The supporting cast also includes Rahul Bose, Zarina Wahab, Vikrant Massey, Ridhima Sud, Pawan Chopra, Parmeet Sethi, Dolly Mattdo and Manoj Pahwa. The film tells the story of the Mehras, a dysfunctional Punjabi family who invite their family and friends on a cruise trip to celebrate the parents' 30th wedding anniversary. Akhtar conceived the film as a family drama centred on a brother-sister relationship. She wanted to depict a more realistic sibling relationship in contrast to the dubious and over-the-top portrayal for which Bollywood is known. Akhtar later co-wrote the screenplay with her friend and longtime collaborator Reema Kagti. Much of the principal photography was done on Pullmantur Cruises' ship MS Sovereign while sailing across the Mediterranean and Europe, and on land in France, Spain, Tunisia, Turkey and Italy. The soundtrack was composed by the trio Shankar–Ehsaan–Loy, with lyrics by Javed Akhtar. The film was released worldwide on 5 June 2015 to positive reviews from critics, who praised the performances of Kapoor, Shah, Chopra and Singh, who portrayed the members of the Mehra family, as well as Akhtar's direction, cinematography and costumes. The film grossed ₹1.45 billion at the box office against a budget of ₹830 million, and earned a number of accolades. It received five Filmfare nominations, winning Best Supporting Actor for Kapoor. Dil Dhadakne Do also received nine nominations at the 2016 Screen Awards, including Best Film, and won two, Best Supporting Actor for Kapoor and Best Ensemble Cast. Kamal Mehra is a businessman who owns AyKa, a company on the verge of bankruptcy. He has a troubled relationship with his wife Neelam, daughter Ayesha and son Kabir. The Mehra family also includes their pet dog, Pluto. Ayesha owns a successful business but is unhappy with her marriage to Manav Sangha, a controlling, narcissistic husband who, together with his mother Smita, hates Ayesha's family. Kabir, who yearns to become a pilot, unwillingly participates in the family business. Kamal and Neelam invite their family and friends for a ten-day cruise across the Mediterranean to celebrate their 30th wedding anniversary. Their guests include the Sood family, consisting of businessman Lalit Sood, his wife Naina and their daughter Noori. Kamal and Neelam plan to get Kabir married to Noori in exchange for Lalit investing in AyKa. The Mehra family and all of their guests board the cruise ship in Italy. Kabir meets Farah, a dancer, and begins a relationship with her. Noori is in love with Rana Khanna, the son of Vinod and Vandana. The Khannas, however, are sworn enemies of the Soods, so Kabir and Noori decide to manipulate their parents into believing they are dating each other while continuing with their respective relationships. Ayesha considers divorcing her husband, whom she believes is incompatible with her. Her parents are staunchly against it, believing it will dishonour the family. Meanwhile, Sunny Gill, the son of Kamal's manager Amrish, arrives on the ship. Sunny and Ayesha dated each other as teenagers. Kamal, who was unhappy with their relationship, arranged and paid for Sunny to study abroad to separate him from Ayesha. Ayesha realises that she still harbours feelings for Sunny, now a successful journalist. Unlike Manav, Sunny appreciates Ayesha's strong personality and believes in female empowerment. Neelam sees Kamal flirting with one of the female guests and wonders why she did not divorce him despite his past infidelities. Ayesha confronts Sunny about his sudden departure and kisses him, which she later regrets because she is married. Meanwhile, Farah hears that Kabir is planning to marry Noori and ends their relationship. Elsewhere, Kamal sees Noori making out with Rana and has a fit, after which he is rushed to the onboard emergency room. At the clinic, Kamal tells Kabir he saw Noori with Rana and asks him to end his relationship with her. Kabir tells his family he knew about the couple's relationship and that he is in love with Farah. He also tells them he intends to leave the family business and asks them to consider Ayesha, who is actually interested in business. He also tries to persuade them to let her proceed with her divorce as she is unhappy with the marriage, but Kamal and Neelam still refuse, believing marriages are lifelong commitments. Infuriated, Kabir tells Kamal that he, Neelam and Ayesha were all aware of his adultery and that Neelam has been bearing his infidelities and suffering silently to save the family. Kamal asks Neelam why she had not divorced him; she reveals she had no choice because her family would not accept her back due to their fear of dishonour. Kamal realises his mistake, asks for Neelam's forgiveness and consoles her. Later, while trying to reconcile Manav and Ayesha, Kamal sees how Manav mistreats his daughter and asks him and Smita to leave. He agrees to the divorce and asks Ayesha for forgiveness. Kabir tries to persuade Farah to forgive him for lying to her, but she is dismissed from her job for being involved with a passenger and is told to leave the ship. Kabir learns about her dismissal after the ship has set sail from the port where it had docked for some time. Seeing no other option, Kabir, aided by Sunny, jumps off the ship, hoping his family will rescue him and help him get ashore. Kamal, Neelam, Ayesha, and Pluto eventually find a lifeboat to rescue him. While leaving, Ayesha asks Sunny if he would wait for her, to which he replies "forever". The family rescue Kabir and head towards the shore while being chased by the ship's crew. The Mehra family is seen happy in each other's presence for the first time. Ivan Sylvester Rodrigues as Dharmapala Sr. When Excel Entertainment announced its upcoming films in March 2012, one of them was Zoya Akhtar's next film following Zindagi Na Milegi Dobara (2011). It was reported that she was working on a script and that filming was due to start in December 2012. Akhtar dismissed the reports, saying she was yet to start writing her next script. In May that year, media reports suggested Akhtar was already writing her next film. That July, it was reported the script was about siblings partially based on Akhtar and her brother Farhan Akhtar. Farhan Akhtar later denied reports of the film being autobiographical, saying it had nothing to do with their real life relationship and that it is entirely a work of fiction. In November 2012, Akhtar said she was still writing the script and that the film was a family drama. Akhtar co-wrote the screenplay with her long-time friend and collaborator Reema Kagti. Akhtar had always aspired to make a family drama with a brother-sister relationship at its core. She felt such topics not been well represented in Indian films, and that the brother-sister relationship bond has always been shown "wrapped in rituals" and never portrayed as it really is. She believed the theme of brother-sister relationships "generally have cheesy representations. They are never at ease. This is one of the most important relationships in the world because nobody else shares your parents. I wanted to show that relationship in Dil Dhadakne Do". Akhtar also wanted to showcase the quirkiness of a dysfunctional family, with different layers to each family member, saying, "the beauty of families lies in their flaws". When asked whether the film had any similarities with her own life and family, she said it had none and that the only thing common to herself and the film's characters was the bond between her and her brother; all their problems and conflicts were unalike. Akhtar said the film was a partly fictionalised version of people around her, such as her friends and their families, and her observations from literature and news articles. Kagti and Akhtar revealed that some of their material came from observing people of Delhi during their friends' back-to-back, elite-class wedding parties as they were finishing the script; they made notes about people's behaviour and demeanor, and incorporated these into their script. After finalising the characters, they felt something was missing, so they added Pluto, the family dog, as an observer. The completed film has 25 characters and a dog. When asked about interweaving travel in the narrative, Akhtar said she and Kagti wanted a device to bring all the characters—the entire family—together. She said the film could have been set anywhere, such as a hill station, but they chose to set it on a cruise ship because the characters would not be able to leave. Akhtar called it a metaphor for the bigger journey that every family undertakes; the characters are stuck together on a ship in the middle of an ocean and could not leave if they wanted to. The film's title Dil Dhadakne Do was chosen because Akhtar wanted a catchy, easily identifiable title. In December 2013, Farhan Akhtar confirmed he was playing a crucial role in his sister's film. In January 2014, Anushka Sharma was cast for the role of Singh's love interest. Madhuri Dixit, Tabu and Raveena Tandon were all approached to play Chopra and Singh's mother in the film; although they liked the part, all of them turned down the role because they did not want to play a mother. Akhtar later approached Shefali Shah for the part, which she accepted. Newcomer Ridhima Sud joined the cast in June 2014. A few days later, Rahul Bose was cast to play the role of Manav (Chopra's husband) in the film. Zarina Wahab joined the cast to play Chopra's mother-in-law. Parmeet Sethi was later cast in an important role. Although meant for a surprise, the details about Aamir Khan's voiceover performance as the family dog Pluto was leaked before the film's release. Javed Akhtar had initially provided the voiceover for Pluto. After watching the film weeks before the release, however, Akhtar asked Aamir to do the voiceover and the actor accepted, saying, "I had loved the film so much that I was just happy to be a part of it ... I think it is a great film to be part of". Compared with the rest of the cast, Akhtar spent a whole year persuading Anil Kapoor to sign up for the film. Akhtar's brother Farhan and father Javed Akhtar also spoke to him about the role. However, when Aamir Khan approached him on Akhtar's behalf, he finally accepted the part. Kapoor described his role of Kamal Mehra as a "manipulative patriarch" and a businessman who "has no qualms about manipulating people, even his own family members, to achieve his goal". He said, "Kamal is a self-made man and does not want to lose [his business empire] and will do anything to save it". Kapoor found playing his character very exciting, being completely opposite to his real self; a patriarch whose company, rather than his family, comes first. Shah called her character, Neelam Mehra, a "Delhi elite society queen bee" with multiple layers, saying, "It looks like nothing can put a chink in her armour, but inside, she is a vulnerable and lost person". She said her character shows an artificial side about her marriage while facing the world, opposed to her behaviour in their home: "It's not one of the best marriages. She hates what’s happened to both of them. But when they come in front of the world, she will stand by her husband". Her character discriminates between her son and her daughter; she said, "She is evidently partial to her son. With her daughter, she displays a mentality typical of many Indian mothers. Even though her daughter is in a bad marriage as well, she discourages her from taking a divorce." Shah said accepted the part because it "was one of the best scripts I had read in a very long time. It was sharp, wicked, and emotional, without being melodramatic." To prepare for her role, she formed an outline of her character by forming Neelam's history and personality. Chopra has described her character, Ayesha Mehra, as strong but also feminine and gentle, noting her inner strength. She said Ayesha has complicated emotions, and that she "has no idea what she wants and she keeps changing her mind, probably like most women ... that is exactly what Ayesha does. She doesn't know which direction to go in. She actually has no opinion on love or marriage, but just wants to be able to feel that she can be loved." Chopra had to shed the muscle weight she gained for playing the boxer in Mary Kom (2014). She said, "I was not muscular but had acquired bulked-up physique. I had to be in right shape as I was playing a girly role. I had to ... go on a crash diet and lose shape." Singh called his character, Kabir Mehra, a privileged, "born with a silver spoon" kind of person who wants to pursue different things other than inherit his father's fortune. He said, "Ever since his childhood, he was raised to take over his father's company. But this isn't what he wants to do. He loves planes, he wants to be a pilot. Because of this miscommunication he is in a lot of pain." Khan described Pluto as a "very philosophical" dog who is "really into observing human nature and has a take on everything". Principal photography began on 17 May 2014 on the Pullmantur Cruises ship MS Sovereign throughout the Mediterranean Sea and onshore in France, Spain, Tunisia, Turkey and Italy. Filming on the ship was done over a non-consecutive period of five weeks; the cast and crew members would board the ship at Barcelona and would film the scenes while en route to different destinations; five different places in five weeks, where the cast and crew would shoot the onshore scenes. Onshore filming took two months, finishing on 18 July 2014. Filming took ninety days, finishing in early August 2014. The second and final schedule began in mid-August 2014 in Mumbai, and was completed on 23 September 2014. Filming also took place in several locations in Turkey, such as Antalya, Cappadocia and Istanbul. For one scene set in Istanbul's Sophia Museum, tourists and museum staff were used as extras for the sequence, which took six hours to film. For a sequence featuring Chopra and Bose's characters playing squash, Chopra, helped by Bose, had to learn the sport on set. The pre-production work was a challenge for the makers, who had to plan everything in detail; Akhtar and her team reconnoitred to find perfect places to shoot the film. Akhtar found the filming unforgettable, saying, "Can you imagine the whole crew is in a new country everyday! That is what it is like to be on a cruise ship in the Mediterranean. It was logistically insane, visually gorgeous and emotionally cathartic." Neil Patel handled the production design. Akhtar's frequent collaborator Carlos Catalan provided the cinematography, and Anand Subaya and Manan Mehta edited the film. Arjun Bhasin designed all of the film's costumes. Bosco–Caesar choreographed the songs; The entire song "Gallan Goodiyaan" was shot in a single five-minute take. It required detailed planning and choreography, which the cast rehearsed before filming it. Dil Dhadakne Do's soundtrack was composed by the trio Shankar–Ehsaan–Loy and Javed Akhtar wrote the lyrics. The album consists of five original songs. The vocals are performed by Priyanka Chopra, Farhan Akhtar, Sukriti Kakar, Siddharth Mahadevan, Shankar Mahadevan, Yashita Sharma, Manish Kumar Tipu, Sukhwinder Singh, Sunidhi Chauhan, Vishal Dadlani, Divya Kumar and Alyssa Mendonsa. It was released on 2 May 2015 by T-Series. The soundtrack received generally positive reviews from critics, who labelled it more narrative-based than a chartbuster. Chopra's singing on the first fully-Hindi song she had recorded was also lauded by critics. Joginder Tuteja of Bollywood Hungama gave a rating of 3.5 out of 5, describing it as "a classy soundtrack [that] is unadulterated when it comes to quintessential Bollywood scheme of things". The Times of India also gave it a rating of 3.5 out of 5, calling the compositions "foot-tapping and swingy". In another positive review, Filmfare said the composers had "done a good job despite the hurdles", noting the limiting setting of the film. Koimoi rated it 2.5 out of 5, terming it a mixed bag. However, it praised the songs "Dil Dhadakne Do" and "Pehli Baar", noting them as standouts. The reviewer wrote that Chopra particularly "impresses with her vocals" in the former song. Dil Dhadakne Do was one of the most highly anticipated films of 2015 owing to its star cast and the success of Akhtar's previous film. The first-look teaser poster, photographed from behind the six pivotal characters and a dog sunbathing on a cruise deck was released on 21 July 2014, almost a year before the scheduled release. The poster did not reveal the actors' looks, instead making the audience puzzle about the actors from behind. A few days later, the first full poster revealing the position of the actors photographed from the front was revealed. In April 2015, seven character posters, including one for the family dog Pluto, were released. The poster releases generated much hype for the film. The trailer release was highly anticipated in the media because the plot was kept secret. Emphasising the theme of the film, Akhtar and Kapoor hosted a private screening of the trailer for their friends and family. The official theatrical release posters were released before the trailer. The almost-three-minute official trailer was released on 15 April 2015, garnering over one million views in less than 24 hours. The trailer was well received by the media, who deemed it promising. Alaka Sahani of The Indian Express called it "overwhelming" and wrote, "The top-view of the cruise line with expansive ocean as the backdrop, stunning foreign locales and beautiful people in their stylish best make for compelling visuals. But scratch the surface, and you find a dysfunctional family trying hard to act normal to the world." The film was released on 5 June 2015 in 2,300 screens worldwide on a budget of ₹830 million. According to an analysis by Box Office India, the film was likely to perform better in major Indian cities than in smaller centres, but predicted it would perform much better overseas due to its niche content. Distributed by Big Home Entertainment, it was released on DVD in all regions on 30 August 2015 as a two-disc pack in NTSC widescreen format; bonus content included the making of the film and deleted scenes. A VCD version was released at the same time. The film's Blu-ray version was released on 5 September 2015. Dil Dhadakne Do had its Indian television premiere on 24 October 2015 on Zee Cinema. The film received positive reviews, receiving praise for the cast performances, humour, cinematography, costumes and direction, but it received criticism for its running time and climax. In a 4-star review for Mumbai Mirror, critic Kunal Guha described the film as an "emotional roller-coaster", comparing Akhtar's direction to that of Woody Allen and Wes Anderson, and complimented the performances of the cast. Rajiv Vijayakar from India-West gave a rating of 4 stars, describing it as "entertaining with stellar performances", praising Akhtar's direction and writing, "Zoya gets the emotions right by making the entertainment riveting and the experience full of many perceptive insights into basic relationships". Srijana Mitra Das of The Times of India gave the film 4 stars, praising the performances of the lead actors and writing, "On this ship, a few bolts could be tighter. But these are fleeting clouds on an otherwise beautiful sea, hosting a cruise ... while searching beyond Bollywood's emotional Botox for a family's warts - and its heart." Shubha Shetty-Saha of Mid-Day gave the film 4 stars and complimented the story, stating, "If this film looks like an entertaining, escapist film at the outset, it is, but it is also much deeper than that". She also appreciated the performances, especially Chopra's and Singh's, writing, "These two blazing talents are magical when they come together sharing what perhaps could be one of the best sibling chemistry in Hindi films". The reviewer from Bollywood Hungama gave the film 3.5 stars, praising Akhtar's direction for "[pulling] off such a magnificent film with such utmost ease". Writing for Hindustan Times, film critic Anupama Chopra rated the film 3.5 stars, commending the performances - particularly those of Kapoor, Shah and Chopra - and the high production value, writing, "There are soaring top shots of the ship, of gorgeous towns in Turkey and Greece, and of staggering fashions". Rachit Gupta of Filmfare described the film as a "spunky comedy, straight from the heart", attributing the performances of the lead actors as the prime reason for the film's success. Sonia Chopra from Sify also gave 3.5 stars, calling Dil Dhadakne Do a film with a "robust heartbeat", admiring Akhtar's ability to create "real and interesting" characters and writing, "Zoya Akhtar brings in several delightful elements of her filmmaking style - there's the gorgeous cast playing interesting characters, the overt and covert equations between them, the hints at societal hypocrisy and sexism, the romance, the gorgeous locales, and the measured pace". Film critic Rajeev Masand of CNN-News18 gave 3 stars, appreciating the performances of the lead actors - especially that of Kapoor and Shah - calling them "absolutely riveting". He praised the humour in the screenplay and concluded that the film is "easy and breezy, and packed with terrific actors who appear to be enjoying themselves", although he criticised the pacing and climax of the film, calling it "silly". In a 3 star review, film critic Mayank Shekhar of ABP News said that "patiently drawing out emotions from every character" made the film "horrendously long [and] too languidly paced", although he called the film ""intensely real, intrinsically adult, with several sharp observations about relationships and life". 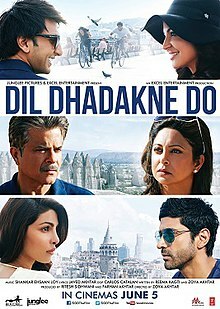 Scoring the film 3 stars, Sukanya Verma of Rediff.com wrote that Dil Dhadakne Do "unravels like an entire season of soap opera condensed into a nearly three-hour movie", but found it "too facile to rise above the charming fluff". Ritika Bhatia of Business Standard wrote that the film "does have its enjoyable moments, but with a three-hour runtime, it fails to sail the high seas", and termed the film "ambitious" but "meandering". Shilpa Jamkhandikar of Reuters called it "Akhtar's weakest film yet, because she tries to tell too many stories at once and tells none entirely". Sarita A. Tanwar of Daily News and Analysis gave the film 2.5 stars, and said it would have "been a lot of fun [if] had it been shorter, crisper and less indulgent". Dil Dhadakne Do had a decent opening, with collections of ₹100 million on its opening day. Collections rose 20% on its second day, collecting ₹120 million, and another 20% on its third day, with collections of ₹140 million for the opening domestic weekend of ₹360 million. Upon its release, the film recorded the highest overseas opening of the year for an Indian film, collecting ₹195 million in its opening weekend. Notably, the film debuted at number 9 at the U.K. Box Office, where it earned $330,000 in its opening weekend. The total worldwide opening weekend collections stood at ₹675 million, making it the top worldwide opener among Indian films at the time of its release. On its first Monday, the film's collections dropped 40%, earning another ₹57.5 million. It earned ₹550 million in its first week at the domestic box office and over ₹980 million worldwide. In its second weekend, Dil Dhadakne Do earned ₹100 million. During its theatrical run, the film grossed over ₹1 billion in India and a further ₹450 million worldwide, for a worldwide total of ₹1.45 billion. Dil Dhadakne Do received a number of accolades, particularly for the actors. It earned five Filmfare nominations, winning Best Supporting Actor for Kapoor. The film was nominated in nine categories at the 2016 Screen Awards, including Best Film, Best Director for Akhtar and Best Actress for Chopra. It went on to win two; Best Supporting Actor for Kapoor and the Best Ensemble Cast. At the 2015 Stardust Awards, the film garnered five nominations, including Actor of the Year – Female for Chopra and Actor of the Year – Male for Singh, winning three awards: Best Supporting Actor for Kapoor, Best Supporting Actress for Shah and Best Costume Design. ^ "Dil Dhadakne Do (2015)". British Board of Film Classification. Archived from the original on 28 September 2015. Retrieved 27 September 2015. ^ a b c d "Dil Dhadakne Do". Box Office India. Archived from the original on 15 June 2017. Retrieved 19 August 2017. ^ a b c "Dil Dhadakne Do Cast & Crew". Bollywood Hungama. Archived from the original on 28 August 2017. Retrieved 28 August 2017. ^ "Farhan and Ritesh announce Excel's line-up". Bollywood Hungama. 20 March 2012. Archived from the original on 19 May 2016. Retrieved 19 May 2016. ^ "Yet to write my next film, so not decided about cast: Zoya Akhtar". The Indian Express. 20 March 2012. Archived from the original on 2 May 2016. Retrieved 20 August 2017. ^ a b "Kareena, Ranbir in Zoya Akhtar's next". Hindustan Times. 8 May 2012. Archived from the original on 21 August 2017. Retrieved 20 August 2017. ^ a b Iyer, Meena (26 July 2012). "Kareena & Ranbir to play reel-life brother and siste". The Times of India. Archived from the original on 19 May 2016. Retrieved 19 May 2016. ^ Indo-Asian News Service (9 December 2013). "Zoya's film has nothing to do with our real life: Farhan (Interview)". Business Standard. Archived from the original on 19 May 2016. Retrieved 19 May 2016. ^ "Zoya Akhtar is scripting a family drama now". CNN-News18. 20 November 2012. Archived from the original on 21 August 2017. Retrieved 20 August 2017. ^ a b Press Trust of India (7 June 2015). "Brother-sister bond not represented well in Bollywood: Zoya Akhtar". The Economic Times. Archived from the original on 19 May 2016. Retrieved 19 May 2016. ^ a b c Indo-Asian News Service (7 June 2015). "Zoya Akhtar: Wanted to Show Brother-Sister Relationship in Dil Dhadakne Do". NDTV. Archived from the original on 19 May 2016. Retrieved 19 May 2016. ^ a b Gupta, Priya (23 May 2015). "The Mehras are very different than the Akhtars: Zoya Akhtar". The Times of India. Archived from the original on 27 August 2017. Retrieved 20 August 2017. ^ a b c Sahani, Alaska (7 June 2015). "I don't think any family is normal, says 'Dil Dhadakne Do' director Zoya Akhtar". The Indian Express. Archived from the original on 21 August 2017. Retrieved 20 August 2017. ^ a b Chopra, Anupama (15 June 2015). "Zoya Akhtar & Reema Kagti - Dil Dhadakne Do - FC Post Mortem". Film Companion. Archived from the original on 21 August 2017. Retrieved 20 August 2017. ^ a b Pal, Chandrima (1 June 2015). "The Zoya Akhtar interview: 'Are my movies about rich people? What does that mean?'". Scroll.in. Archived from the original on 2 June 2015. Retrieved 20 August 2017. ^ Devi Dundoo, Sangeetha (9 June 2015). "A voice from afar". The Hindu. Archived from the original on 13 January 2018. Retrieved 20 August 2017. ^ a b c Jha, Subhash K. (1 June 2015). ""It took Aamir Khan to go and convince Anil Kapoor for Dil Dhadakne Do" – Zoya Akhtar". Bollywood Hungama. Archived from the original on 21 August 2017. Retrieved 20 August 2017. ^ "Hrithik, Kareena, Katrina and Ranveer to Star in Zoya Akhtar's Next Film?". International Business Times. 6 May 2013. Archived from the original on 25 August 2017. Retrieved 25 August 2017. ^ Singh, Prashant (8 June 2013). "Ranveer Singh set to replace Ranbir Kapoor?". Hindustan Times. Archived from the original on 25 August 2017. Retrieved 25 August 2017. ^ Thakkar, Mehul S (28 December 2012). "Kareena-Hrithik and Ranbir-Katrina in Zoya's next film". The Times of India. Archived from the original on 29 August 2017. Retrieved 25 August 2017. ^ "Not doing Zoya's film is my loss, says Kareena Kapoor". India Today. 24 July 2014. Archived from the original on 13 January 2018. Retrieved 25 August 2017. ^ "Priyanka Chopra to play Ranveer Singh's elder sister?". Zee News. 22 June 2013. Archived from the original on 25 August 2017. Retrieved 25 August 2017. ^ "Anil Kapoor to portray father to grown up children". NDTV. 3 October 2013. Archived from the original on 27 August 2017. Retrieved 27 August 2017. ^ "Farhan Akhtar in sister Zoya's film". Bollywood Hungama. 3 December 2013. Archived from the original on 8 December 2013. Retrieved 23 February 2014. ^ "Ranveer, Anushka to romance in Zoya Akhtar`s next?". Zee News. 31 January 2014. Archived from the original on 25 August 2017. Retrieved 25 August 2017. ^ a b "When Raveena Tandon refused to play Ranveer Singh's mother". India Today. 14 May 2014. Archived from the original on 17 May 2014. Retrieved 31 May 2014. ^ "Zoya Akhtar to launch newbie Ridhima Sud in Dil Dhadakne Do". Bollywood Hungama. 19 June 2014. Archived from the original on 27 August 2017. Retrieved 27 August 2017. ^ "Rahul Bose joins the starcast of Zoya's Dil Dhadakne Do". Bollywood Hungama. 21 June 2014. Archived from the original on 27 August 2017. Retrieved 27 August 2017. ^ "Zarina Wahab plays Priyanka's mother-in-law in Dil Dhadakne Do". Bollywood Hungama. 23 July 2014. Archived from the original on 27 August 2017. Retrieved 27 August 2017. ^ "Zoya Akhtar signs Parmeet Sethi for Dil Dhadakne Do". Bollywood Hungama. 2 August 2014. Archived from the original on 27 August 2017. Retrieved 27 August 2017. ^ Pathak, Ankur (29 May 2015). "AK turns bullmastiff for Zoya". Mumbai Mirror. Archived from the original on 27 August 2017. Retrieved 27 August 2017. ^ Indo-Asian News Service (8 June 2015). "Didn't think twice before playing Pluto the dog: Aamir Khan". The Indian Express. Archived from the original on 27 August 2017. Retrieved 27 August 2017. ^ a b c Jha, Subhash K. (1 June 2015). ""It took Aamir Khan to go and convince Anil Kapoor for Dil Dhadakne Do" – Zoya Akhtar". Bollywood Hungama. Archived from the original on 21 August 2017. Retrieved 27 August 2017. ^ a b c Khan, Ujala Ali (2 June 2015). "Anil Kapoor on playing a manipulative patriarch in Dil Dhadakne Do". The National. Archived from the original on 28 August 2017. Retrieved 27 August 2017. ^ a b c Ghosh, Sankhayan (13 June 2015). "Shefali Shah: I was 21 when I played a mother". The Indian Express. Archived from the original on 27 August 2017. Retrieved 27 August 2017. ^ a b N, Patcy (4 June 2015). "'I hate myself on screen'". Rediff.com. Archived from the original on 27 August 2017. Retrieved 27 August 2017. ^ N, Patcy (1 June 2015). "Priyanka: I am very greedy about my work". Rediff.com. Archived from the original on 24 December 2016. Retrieved 27 August 2017. ^ Khan, Ujala Ali (2 June 2015). "Priyanka Chopra and Ranveer Singh on the bittersweet comedy Dil Dhadakne Do". The National. Archived from the original on 27 August 2017. Retrieved 27 August 2017. ^ Press Trust of India (24 July 2014). "Post 'Mary Kom', Priyanka Chopra had to tone down for 'girly role' in 'Dil Dhadakne Do'". The Indian Express. Archived from the original on 28 August 2017. Retrieved 27 August 2017. ^ a b "Did Ranveer Singh reveal the plot of Dil Dhadakne Do?". India Today. 15 July 2014. Archived from the original on 29 August 2017. Retrieved 27 August 2017. ^ a b c Kulkarni, Onkar (4 June 2015). "Behind The Scenes: What happened when Dil Dhadakne Do ship Pullmantur broke down?". Dainik Bhaskar. Archived from the original on 29 August 2017. Retrieved 29 August 2017. ^ a b c "'Dil Dhadakne Do' cast begin shooting in Mumbai". Mid Day. 18 August 2014. Archived from the original on 6 January 2015. Retrieved 29 August 2017. ^ "A birthday surprise for Priyanka Chopra". Mid Day. 18 July 2014. Archived from the original on 29 July 2014. Retrieved 20 July 2014. ^ "It's a wrap for Dil Dhadakne Do - exes Ranveer, Anushka party with director Zoya". The Indian Express. 24 September 2014. Archived from the original on 6 November 2014. Retrieved 29 August 2017. ^ a b c "'Dil Dhadakne Do' was logistically insane, visually gorgeous and emotionally cathartic: Zoya Akhtar". Daily News and Analysis. 18 May 2015. Archived from the original on 23 July 2015. Retrieved 29 August 2017. ^ a b "Some interesting facts from the sets of 'Dil Dhadakne Do'". The Times of India. 7 June 2015. Archived from the original on 10 October 2016. Retrieved 29 August 2017. ^ a b "'Gallan Goodiyaan' song from 'Dil Dhadakne Do' was shot in 5 minutes". The Indian Express. 4 May 2015. Archived from the original on 20 February 2017. Retrieved 29 August 2017. ^ a b c d Tuteja, Joginder (4 May 2015). "Dil Dhadakne Do Music Review". Bollywood Hungama. Archived from the original on 12 August 2017. Retrieved 12 August 2017. ^ Fernandes, Kasmin (22 May 2015). "Dil Dhadakne Do". The Times of India. Archived from the original on 18 August 2017. Retrieved 12 August 2017. ^ Sharma, Devesh (22 May 2015). "Music Review: Dil Dhadakne Do". Filmfare. Archived from the original on 12 August 2017. Retrieved 12 August 2017. ^ Redkar, Surabhi (30 May 2015). "Dil Dhadakne Do Music Review". Koimoi. Archived from the original on 28 May 2017. Retrieved 12 August 2017. ^ "Dil Dhadakne Do (Original Motion Picture Soundtrack)". iTunes. Archived from the original on 29 August 2017. Retrieved 12 August 2017. ^ Kotwani, Hiren (28 March 2017). "Zoya Akhtar's friends eagerly awaiting 'Dil Dhadakne Do' trailer". The Times of India. Archived from the original on 29 August 2017. Retrieved 19 August 2017. ^ Mangaokar, Shalvi (27 March 2015). "Here's why Zoya Akhtar is secretive about Dil Dhadakne Do trailer". Hindustan Times. Archived from the original on 19 August 2017. Retrieved 19 August 2017. ^ Divya, Goyal (21 July 2014). "First look: Ranveer, Priyanka, Anushka, Farhan in 'Dil Dhadakne Do'". The Indian Express. Archived from the original on 19 August 2017. Retrieved 19 August 2017. ^ a b "Dil Dhadakne Do second poster out: Meet the 'pagal parivar'". India Today. 24 July 2014. Archived from the original on 1 December 2015. Retrieved 19 August 2017. ^ "'Dil Dhadakne Do' First Look Poster Out". Koimoi. 24 July 2014. Archived from the original on 19 August 2017. Retrieved 19 August 2017. ^ Goswami, Parismita (11 April 2015). "'Dil Dhadakne Do': Meet Pluto, New Member of Mehra Family [PHOTOS]". International Business Times. Archived from the original on 19 August 2017. Retrieved 19 August 2017. ^ "Farhan Akhtar watches 'Dil Dhadakne Do's trailer, but can't show it to anybody". The Indian Express. 9 April 2014. Archived from the original on 19 August 2017. Retrieved 19 August 2017. ^ "Anil Kapoor Hosted A Screening For Dil Dhadakne Do's Trailer". Koimoi. 14 April 2015. Archived from the original on 22 June 2017. Retrieved 19 August 2017. ^ Indo-Asian News Service (11 April 2015). "'Dil Dhadakne Do' crew planning private trailer screening". The Indian Express. Archived from the original on 19 August 2017. Retrieved 19 August 2017. ^ Prashar, Chandni (15 April 2015). "Mehras 'Embark on Epic Journey' in Brand New Dil Dhadakne Do Poster". NDTV. Archived from the original on 19 August 2017. Retrieved 19 August 2017. ^ Chatterjee, Suprateek (15 April 2015). "Watch: Star-Studded 'Dil Dhadakne Do' Trailer Features Generous Helpings Of Family Dysfunction". HuffPost. Archived from the original on 19 August 2017. Retrieved 19 August 2017. ^ a b Press Trust of India (15 April 2015). "Dil Dhadakne Do Trailer Praised by Stars; Special Mention For Anil Kapoor". NDTV. Archived from the original on 19 August 2017. Retrieved 19 August 2017. ^ Kaushal, Ruchi (15 April 2015). "Dil Dhadakne Do trailer: Anushka Sharma, Ranveer Singh, Priyanka Chopra steal the show". The Times of India. Archived from the original on 23 April 2015. Retrieved 19 August 2017. ^ Sahani, Alaka (15 April 2015). "Watch Priyanka, Ranveer, Anushka's 'Dil Dhadakne Do' trailer: Feel the heartbeat". The Indian Express. Archived from the original on 19 August 2017. Retrieved 19 August 2017. ^ Prashar, Chandni (5 June 2015). "Today's Big Release: Dil Dhadakne Do". NDTV. Archived from the original on 19 August 2017. Retrieved 19 August 2017. ^ "Dil Dhadakne Do Looking Good For Big Metros". Box Office India. 4 June 2015. Archived from the original on 20 August 2017. Retrieved 19 August 2017. ^ "Dil Dhadakne Do DVD". Amazon. Archived from the original on 20 August 2017. Retrieved 19 August 2017. ^ "Dil Dhadakne Do Blu-ray". Blu-ray. Archived from the original on 20 August 2017. Retrieved 19 August 2017. ^ "Dil Dhadakne Do VCD". Induna. Archived from the original on 10 February 2016. Retrieved 19 August 2017. ^ "Dil Dhadakne Do to have a grand world television premiere". The Times of India. 24 October 2015. Archived from the original on 27 August 2017. Retrieved 19 August 2017. ^ "Dil Dhadakne Do has a fantastic weekend". Filmfare. 8 June 2015. Archived from the original on 1 July 2017. Retrieved 27 October 2017. ^ Guha, Kunal (5 June 2015). "Film Review: Dil Dhadakne Do". Mumbai Mirror. Archived from the original on 6 June 2015. Retrieved 5 June 2015. ^ Vijayakar, Rajive (5 June 2015). "'Dil Dhadakne Do' Movie Review: Inspiring Story Entertains with Stellar Performances". India-West. Archived from the original on 12 July 2015. Retrieved 20 August 2017. ^ Mitra Das, Srijana (4 June 2015). "Dil Dhadakne Do Movie Review". Archived from the original on 5 June 2015. Retrieved 5 June 2015. ^ a b Shetty-Saha, Shubha (4 June 2015). "'Dil Dhadakne Do' - Movie Review". Mid Day. Archived from the original on 5 June 2015. Retrieved 5 June 2015. ^ "Dil Dhadakne Do Review". Bollywood Hungama. 4 June 2015. Archived from the original on 7 June 2015. Retrieved 4 June 2015. ^ Chopra, Anupama (8 June 2015). "Dil Dhadakne Do review by Anupama Chopra: A flawed family". Hindustan Times. Archived from the original on 20 August 2017. Retrieved 20 August 2017. ^ Gupta, Rachit (5 June 2015). "Movie Review: Dil Dhadakne Do". Filmfare. Archived from the original on 6 June 2015. Retrieved 5 June 2015. ^ Chopra, Sonia (5 June 2015). "'Dil Dhadakne Do' review: This one has a robust heartbeat!". Sify. Archived from the original on 20 July 2017. Retrieved 20 August 2017. ^ Masand, Rajeev (6 June 2015). "'Dil Dhadakne Do' review: It's easy and breezy, and packed with terrific actors". CNN-News18. Archived from the original on 7 June 2015. Retrieved 6 June 2015. ^ Shekhar, Mayank (5 June 2015). "Film review: Dil Dhadakne Do: Long, languid, but intensely real & likeable". ABP News. Archived from the original on 6 June 2015. Retrieved 5 June 2015. ^ Verma, Sukanya (5 June 2015). "Review: Dil Dhadakne Do is charming fluff". Rediff.com. Archived from the original on 6 June 2015. Retrieved 5 June 2015. ^ Bhatia, Ritika (5 June 2015). "Movie Review: Dil Dhadakne Do is a meandering tale of luxe angst". Business Standard. Archived from the original on 5 June 2015. Retrieved 5 June 2015. ^ Jamkhandikar, Shilpa (5 June 2015). "Movie Review: Dil Dhadakne Do". Reuters. Archived from the original on 9 August 2016. Retrieved 5 June 2015. ^ Tanwar, Sarita A (5 June 2015). "Dil Dhadakne Do review: Would have been more fun had it been shorter, crisper and less indulgent". Daily News and Analysis. Archived from the original on 5 June 2015. Retrieved 5 June 2015. ^ "Dil Dhadakne Do First Day Business". Box Office India. Archived from the original on 20 August 2017. Retrieved 19 August 2017. ^ "Dil Dhadakne Do First Weekend Business". Box Office India. 8 June 2015. Archived from the original on 20 August 2017. Retrieved 19 August 2017. ^ "Top Overseas Openings - Dil Dhadakne Do Tops". Box Office India. 8 June 2015. Archived from the original on 20 August 2017. Retrieved 19 August 2017. ^ Alex Ritman (10 June 2015). "U.K. Box Office: 'Empire Strikes Back' Returns to Top 10". The Hollywood Reporter. Archived from the original on 10 June 2015. Retrieved 10 June 2015. ^ "Dil Dhadakne Do Is Top Worldwide Opener Of 2015". Box Office India. 8 June 2015. Archived from the original on 20 August 2017. Retrieved 19 August 2017. ^ "Dil Dhadakne Do First Monday Business". Box Office India. 9 June 2015. Archived from the original on 20 August 2017. Retrieved 19 August 2017. ^ a b "Dil Dhadakne Do Second Weekend Business". Box Office India. 15 June 2015. Archived from the original on 20 August 2017. Retrieved 19 August 2017. ^ "Full list of winners of the 61st Britannia Filmfare Awards". Filmfare. 15 January 2016. Archived from the original on 16 March 2016. Retrieved 16 January 2016. ^ "Winners of 22nd Annual Star Screen Awards 2015". Bollywood Hungama. 8 January 2015. Archived from the original on 30 March 2016. Retrieved 10 January 2015. ^ "22 Star Screen Awards". Hotstar. Archived from the original on 17 March 2016. Retrieved 26 January 2016. ^ "Nominations for Stardust Awards 2015". Bollywood Hungama. 15 December 2015. Archived from the original on 30 March 2016. Retrieved 20 December 2015. ^ Ghosh, Raya (22 December 2016). "Stardust Awards 2016: Complete List of Winners". NDTV. Archived from the original on 25 January 2016. Retrieved 11 February 2016.